At least it does to the lion, king of the animals, who begrudgingly welcomes a little orphaned elephant seeking shelter at his palace. The pair becomes inseparable, enjoying stories and games. Years pass; the elephant grows, as small creatures do. The lion, never large anyway, has stopped growing, as is the wont of adults. 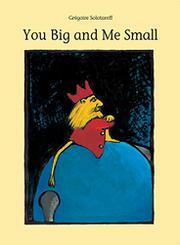 The relationship sours; the king demands reassurance that, despite the size differential, he is dominant. The elephant, as big in character as in stature and girth, repeatedly allows that the king is big and he is small. Appeasement doesn’t work, and the king banishes the elephant. Much later the elephant encounters the now-wizened, forlorn lion, who concedes he was overthrown for arrogance and pride. The elephant staunchly proclaims the lion is still royal and big, and they return to the palace. This odd French fable, a Canadian import, seems aimed to convey messages about the folly of false pride and the beauty of true friendship. Are readers also warned about parent-child relationships? If so, how—should kids not grow, or adults will abandon them? The narrative’s lack of clarity, abetted by uneven translation (occasional mixing of tenses), is softened somewhat by vivid if static oil paintings. Readers will appreciate the elephant’s bemused expressiveness but may find the depiction of the lion with human face and extremities creepy.